MAI TAI VILLA sits on the beautiful sandy beach of Silver Sands on the North Coast of Jamaica, only 35 minute from Montego Bay -- the perfect destination for your vacation in paradise. 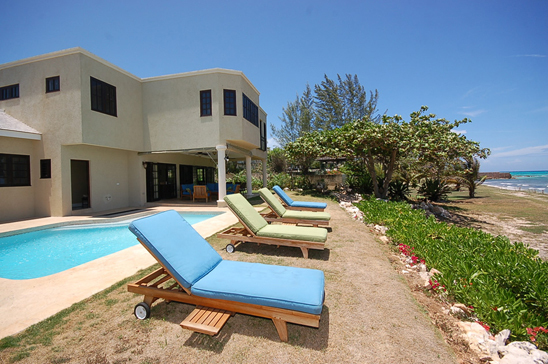 Mai Tai Villa is a beautifully constructed four bedroom villa, in a premium waterfront location with a unobstructed view of the blue Caribbean Sea which is just a stones throw away from your own private patio and 5 minute walk from the main Silver Sands beach area. The comfortable open design living room and a large kitchen with modern appliances is where Ma Tai's superb staff will cater to your every desire, from gourmet meals to exotic cocktails. The poolside verandah with outdoor eating area will probably be your main go to destination to have your meals while soaking in the beautiful vista. The property’s location is ideal for families, friends and can even be grouped together with other nearby villas to provide the perfect location for large group getaways. Mai Tai Villa Sleeps 1-8 guests. All bedrooms are air conditioned with ceiling fans and ensuite bathrooms. Bedroom 1/Master: king bed, en-suite bathroom with Jacuzzi tub and outdoor shower, TV, air conditioning and ceiling fan. Double doors open to beautiful sea views. Bedroom 2: queen bed, en-suite bathroom, TV, air conditioning and ceiling fan. Bedroom 3: queen bed, en-suite bathroom, TV, air conditioning and ceiling fan. Bedroom 4: two double beds, en-suite bathroom, TV, air conditioning and ceiling fan. Cable TV, VCR, CD player, radio and cassette stereo. Balance due at least 60 days prior to arrival.